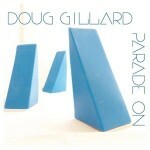 Share the post "Album review: DOUG GILLARD – Parade On"
Cleveland underground rock veteran Doug Gillard (Death of Samantha, Cobra Verde, Gem, Guided Voices, Nada Surf) knows exactly what he wants. ‘Parade On’ is an album packed with layered harmonies and jangly guitar-led power pop with good hooks. He wrote all the material, played all the instruments except for drums and lent his hand to the production and mixing duties on 11 songs that gently wash over you. It’s music with an array of familiar influences from The Beatles, The Byrds, Squeeze, and XTC, to the more obscure vocal connections with The Association, Love and America. But it’s also an album shot through with an energetic punk like sensibility that reveals itself more clearly in the latter quarter of an engaging album. There’s lashing of throbbing riffs, locked in rhythms, catchy hooks and potent bv’s, which all contribute to little tension building moments and their subsequent resolution. He opens with the acoustic wash of ‘Ready For Death’, which has a George Harrison ‘My Sweet Lord’ feel to it, complete with The Byrds style jangling guitar sound and a poppy melodic arrangement that lies at the core of the album. ‘Angel X’ is post-punk power pop with an Elvis Costello feel, while ‘Your Eyes’ is a return to the sun kissed vocals that you would find on 70’s albums by say Bob Welch or America, but he levers you in with a blend of lush harmonies catchy hooks and glistening guitar lines. It’s an album built by design and with a clear vision of what it is he’s trying to create. The sudden tempo shift of ‘Upper Hand’ for example, the jangling guitar line of ‘Oh My Little Girl’, the subtle vocal inflection of ‘Your Eyes and the unrelenting riff of ‘Overseas’ are all essential elements of his broad musical canvas. Each piece flows into the next, not so much in a linear progression as part of an interrelated musical collage. ‘I Shalt Not Want’ is much more languid and deeper in tone with Kevin Ayers style phrasing that draws the listener in. In sharp contrast, ‘Overseas’ is infused with post-punk energy in a Joe Jackson vein, and is probably a throw back to Doug’s own early career new wave influences, except he sticks rigorously to a harmony led-arrangement and builds it up promisingly until an all too sudden fade. In many ways it’s indicative of the way Doug hits on a riff or groove and runs with it, relegating several pieces to a fleeting sketch rather than a full blown song. As if to emphasize the point, he locks into the energetic drone like vamp of ‘Overseas’ and doesn’t let go, contenting himself with some electric squalls and twang guitar over wall of sound and a hypnotic express train rhythm. It all works well within the context of the album as a whole, bringing momentum and flow. ‘Come Out & Show Me’ has a Roger McGuinn style vocal and is notable for its layered synth solo. ‘Oh My Little Girl’ references XTC, The Byrds and The Beatles, while the punky rumble of ‘No Perspective’ sounds almost out of place with the rest of a delicately crafted production. It’s is a quantum leap back to 70’s punk era with a repeated chanted hook and sudden guitar driven avalanche. It sounds like something he might have knocked out in a few minutes down-time, but it’s no worse for that! The riff driven ‘On Target’ could be Lou Reed, before it explodes into a short but effective manic shred, and Doug’s vocal on the title track gives it an uplifting feel over a guitar drenched wall of sound and a Beatles style guitar motif. You could imagine it being stretched out as a live favourite. This entry was posted in ALBUM REVIEWS, ALBUM REVIEWS (Mobile), All Posts and tagged album, America, Bob Welch, Cobra Verde, Death of Samantha, Doug Gillard, Elvis Costello, Gem, George Harrison, Guided Voices, Joe Jackson, Kevin Ayers, Lou Reed, Love, Nada Surf, Parade On, review, Roger McGuinn, Squeeze, The Association, The Beatles, The Byrds, XTC. Bookmark the permalink.